It’s no surprise to the agricultural community, but the 2017 Census of Agriculture confirmed it Thursday—Texas farmers and ranchers are doing more with less and taking fewer days off to get it done. In 2017, there were 248,416 farms in Texas. That’s 390 fewer than in 2012, but 20,243 more than logged in the 1997 census. Farms are slowly getting smaller over time. In 1997, the average farm in Texas sat on 587 acres. The average size, according to the 2017 census, is 511 acres. There are now a little over 127 million acres actively used in farming—6.9 million acres fewer than 1997. There are more producers listed in the 2017 census, according to Hundl, because it enabled respondents to list multiple principle producers, instead of just one, to better capture the roles of people involved in farming. There were 252,273 male and 156,233 female farmers in Texas at the time the census was taken. According to Harris, women were more involved in day-to-day decision making and financial management decisions, while men were more involved with land use and livestock decisions. There were 28,187 young farmers in Texas and 118,999 new and beginning farmers and ranchers. The number of cows and calves, milk cows, hogs and pigs, sheep and lambs all rose between the 2012 and 2017 census. Of all the farmers and ranchers in Texas in 2017, 139,795 reported they took no days of farm work off in the past year. There were 2.04 million farms and ranches across the U.S. in 2017, down 3.2 percent from 2012. 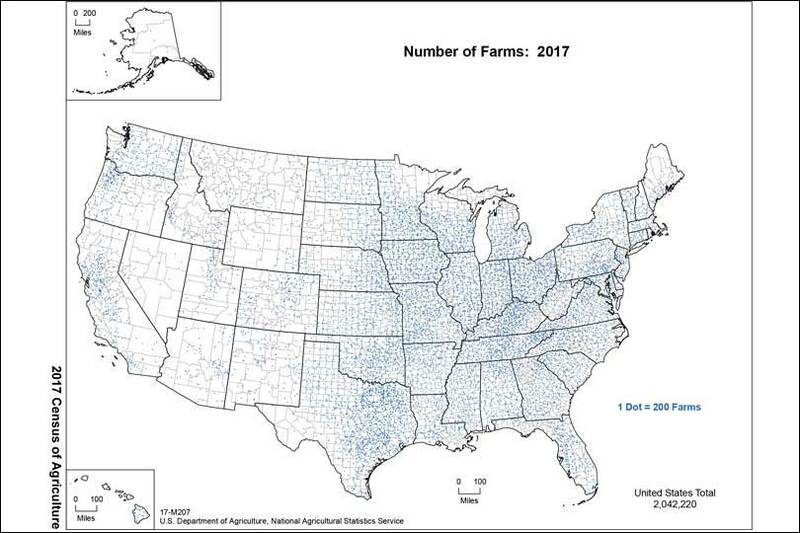 “The number of farms at the U.S. level decreased about 67,000 farms. Many of those are in the mid-sized category of 50 to 499 acres,” Joe Parsons, Ag Statistics Board chair, said. There were around 900 million acres used in farming and ranching in 2017. “It’s roughly made up of about equal parts permanent pasture and cropland, each at about 400 million acres a piece, and then about another 100 million that’s woodland and other uses,” Parsons said. Of the 396 million acres devoted to cropland, about 320 million acres were harvested in 2017. This information is used to help show the changes in the structure of agriculture, Hundl said. Click here to access the full 2017 Census of Agriculture.